Are you making the best use of your washing machine functions? Have a washing machine at home but seldom use the functions? Confused with the many symbols you’re seeing on your washing machine and only use the standard settings? What does Air Turbo, Fuzzy, Eco Tub Cleaning on your washing machine mean? 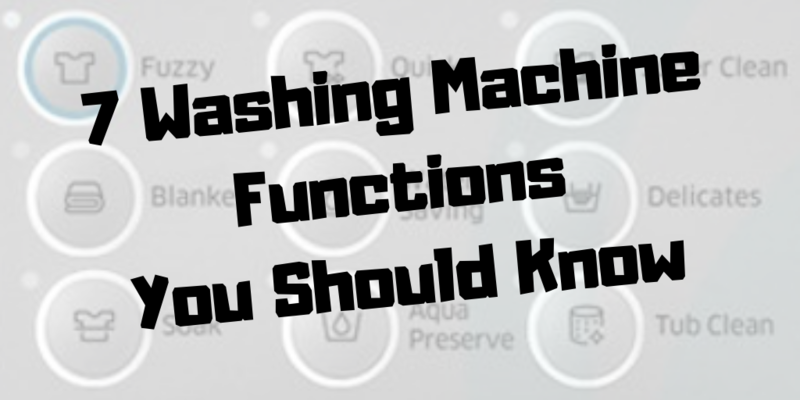 Find out more as we share some of the generic functions so that you can make the best use of your washing machine at home. This is the standard setting for a cycle of wash most suitable for full load dirty laundry that requires sufficient cleaning with the most agitation. Most washing machines are preset with this function. If you have more delicate fabrics to wash, want to save on electricity and water, or are rushing for time, check out the other functions below. This setting allows you to complete your laundry in a faster time with a shorter cycle as compared to the Fuzzy / Regular setting. Most washing machines with this function operates optimally with a lighter load. You might find your clothing not as clean if you use this setting for a full load of dirty laundry. Suitable for delicate fabrics that require gentle cleaning and protection from the normal agitation of the standard setting. Select this function for light fabrics, for instance, bras, lingerie, pantyhose or woven items and perhaps some hand-wash recommended items only. You might also notice that the cleaning power is much gentler. Most washing machines today have water saving functions. Some would even have a better advantage to allow for water recycling while rinsing so that you can reuse the laundry water for other uses, e.g. flushing toilet, watering plants, etc. The water saving function allows for better washing power and up to 30% of water saved to remove dirt and prevent more water pollution. Instead of acting like a dryer with heat, this function is designed to remove most of the moisture from your laundry after spinning dry so that your clothes will dry faster. This is especially useful in wet weather conditions, like the rainy and monsoon periods. This function runs mostly on low water temperature to save on energy while maintaining the same washing power and results. It is also suitable when washing your normal everyday clothing that may not require much care or handling. This washing machine function is generally used for the purpose of cleaning and maintenance of your washing machine only, not for washing laundry. Tub cleaning keeps your washing machine in optimal performance by removing detergent and other residue buildups that may clog your machine and lower the efficiency of your washing machine. Do check out the recommended maintenance cycle and cleaning agent suited for your washing machine. So there you have it, seven of the most common washing machines functions available nowadays yet often overlooked. If you are looking to maximise your investment on your washing machine and save up on your utility bills, do explore and try out the above functions.